Say, for example, that you're thinking about buying a home that was remodeled without a permit. Maybe it wasn't a very big remodeling job and it involved only a sunroom that was added off the back of the house. The sellers disclose that the work was done without a permit. The sellers might have also replaced the kitchen cabinets and counters, and completed various other projects over time that they have failed to mention. As a buyer, you likely don't know what needs a permit and what doesn't, but you love the house and want to buy it. How much trouble can you get into by buying this home that was remodeled without a permit? It would be prudent to first find out what your agent has to say about the work being done without a permit because most laws regarding permits are local and vary from city to city and state to state. Your agent might know what kind of problems you can encounter by buying a home that has improvements without a permit in this locale. If you polled 100 people who had recently remodeled a home and asked how many pulled a permit, it wouldn't be unusual or uncommon for more than 80 percent to admit that they had not applied for a permit. Several reasons exist for homeowners to skip out on getting permits for their home improvements. Remodeling permits can cost too much: Permits are typically based on the price of the project. Say you've built a new garage, estimated the cost to be about $6,000, and although your permit was only about $100, all of the costs add up and you decided to skip getting it. Unfortunately, it's not a good idea to try to build a structure that your neighbors can see without obtaining a permit, because you could have busybody neighbors that end up reporting you to the city. Possible additional and unreasonable requirements: Some say they've never met two city inspectors who agree on anything. Sometimes, city code is open to interpretation. For example, if a homeowner is planning to remodel a kitchen, city code might require that the homeowner replaces an electrical box or makes some other type of improvement that could add thousands of dollars to the job. On a garage project, say a city inspector tells a homeowner to dig a trench 18-inches deep for the electrical. When an inspector comes back to review the finished job, this second inspector says the trench needed to be 24 inches deep or else the homeowners needs to install a shut-off switch in the basement. This type of scenario can cost additional time, money and effort over something that's seemingly unimportant and arbitrary. 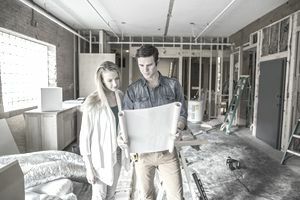 Remodeling permits can cause delays: Say you're working on your new garage project, and you can't finish building it until the city inspector comes out to sign off on the permit. If the city is running behind and becomes backlogged by several weeks, all of your work will have to come to a halt while you wait. Partly for this reason, inspectors often sign off on work in stages. Permits are too much trouble to obtain: True, you have to go down to the city and apply, bring your building plans and get them approved. It's a hassle for some people, and many homeowners rather would just do the work and forget about a permit. Homeowners think they won't get caught: Some homeowners say, out of sight, out of mind, and they think nobody will ever catch them. But what happens when you decide to get a permit for your next project? The city inspector might spot a previous improvement, check the city's records and find out there was no permit issued. Rumor has it that city inspectors have been known to drive down alleys looking for discarded packing materials from non-permitted home improvement projects. Non-permitted work might not be done correctly or to code: Just because a homeowner hires a contractor doesn't mean the contractor will do the job correctly. In addition, there is typically more than one way to do a job, and all three of those could be wrong. Homeowner's insurance might not cover a defect for non-permitted remodeling: If a remodel was done incorrectly and something happens, say a hot wire slips out of a wire nut and a fire breaks out. The damage caused by that fire might not be covered by a homeowner's insurance policy if the improvement was finished without a permit. The city might require you to tear it out: City code often requires that framing is inspected by the city prior to hanging drywall. To determine if studs were installed in a bathroom 16-inches on center, for example, a city inspector might make a homeowner tear out the walls. All the ceramic wall tiles would go with it, too, requiring replacement. The city might assess penalties: If a permit seems expensive, wait until you get a bill for the fines and penalties for failure to obtain a permit. The job permit could cost you triple or quadruple the amount of the original permit fee. A home appraiser might not include an addition in the square footage: If the appraiser does not include the added square footage in the appraisal, the home will probably appraise for much less. This means a seller might be turned down for a refinance. A buyer might not be able to get a loan to buy the home. Look at this way, if a 10x10 room is not permitted, that's 100 square feet. At $200 a square foot, you could lose $20,000. Can the Seller Obtain a Building Permit After the Fact? In some cases, yes. A home seller in Carmichael, California, who had paid a contractor to obtain a permit for their addition insisted there was a permit for the work, even though the County records obtained by the realtor obtained did not show any permits. The buyer ended up cancelling the transaction because of the missing permit. The unpermitted square footage was also not included in the home appraisal, which meant the sellers could not sell their home at the amount they wanted as the appraisal now came in at a lower amount. It might seem that an additional 100 square feet, for a room that measures 10 feet by 10 feet, is insignificant, but if the price per square foot is $300, that's $30,000 less in appraised home value. Unfortunately, in this scenario, the contractor had long gone out of business. The sellers had to obtain an "as built" permit from the county, which involved hiring an architect to draw the plans, with the County conducting many reviews. It cost the sellers about $8,000, but at least that was better than losing $30,000. The best way to protect yourself when buying a home is to verify with the city that permits have been issued, that the square footage matches the city records, and to get a home inspection.